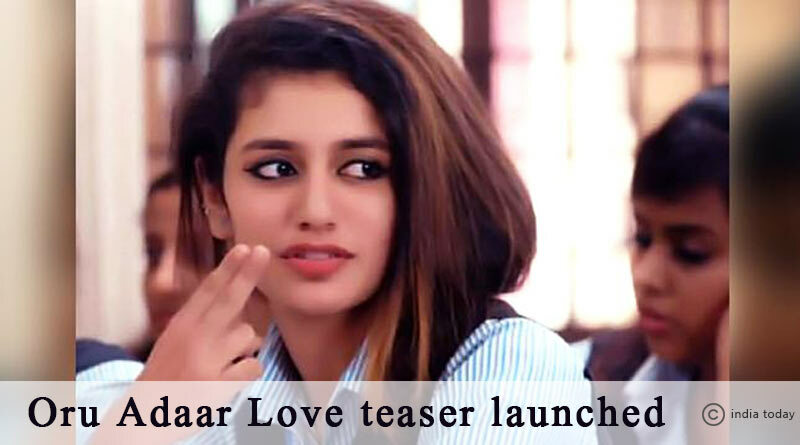 Oru Adaar Love Teaser Launched: Priya Prakash Steal The Show Again! You all may know about the internet sensational girl and the nation’s latest crush Priya Prakash Varrier, the girl with a cute wink with a gun in her latest song. Just from the small video where Priya is seen smiling and winking to a fellow student, has taken the social media by storm. On Valentine’s day makers of “Oru Adaar Love” have released a short teaser clip from the film as well as a song “Manikya Malaraya Poovi“. Once again, Priya fascinates the folk by her captivating expressions, after throwing in a wink to her co-star in the film, Roshan AddulRahoof, Priya is shown to be shooting playful flying kisses at him in the song. Footage of the song from the film ” Oru Adaar Love” is extremely viral as it found its way into internet memes and brought overnight fame for Priya, as she gained lakhs followers instantly on her social media handles. The filmmaker chooses to focus on high school romance, in which they have shown adorable duo sharing the innocent chemistry. Oru Adaar Love is a romantic comedy film directed by Omar Lulu, starring Priya Prakash Varrier, SiyadhShajahan, Roshan Abdul Rahoof, and NoorinShereef in the lead roles and has music by Shaan Rahman. The release date of the movie is 3rd March 2018. From the film Priya Prakash is making her debut in the world of cinema. Here is the official teaser of the movie. Priya Prakash Varrier is 18years old and first-year student, studying commerce at Vimala College in Thrissur Kerela. In her recent interview, the actor expressed her feeling by stating that “it was surreal that she was getting too much love from her fans through internet especially.